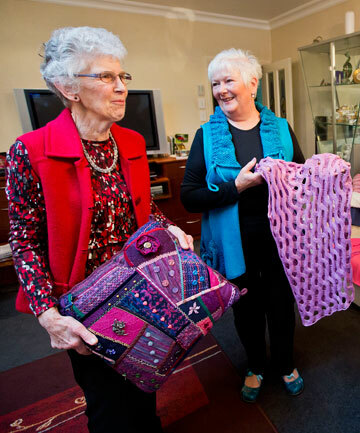 A celebration of colour, texture and creativity is planned to bring Palmerston North Girls’ High School to life in the holidays when 130 machine knitters from around New Zealand converge for their annual festival. Fibre to Fabric – A Festival of Crafted Creations, features a programme of public displays, stalls and demonstrations and workshops for participants. New Zealand Machine Knitters Association festival committee president Jan Hughes said just as hand knitting was enjoying a resurgence of interest, so was machine knitting. The Manawatu area has an active group of 50 members who take particular delight in drawing younger women and men into their regular craft sessions and tutorials. At the festival, anyone who harboured the notion that knitting machines were just for producing plain, regular results that even out the texture of hand knits would soon be disabused of the idea. With all sorts of computer tricks, techniques and inspiration, machine knitters are churning out garments and home furnishings that would make a hand knitter envious. Organisers are particularly delighted to have attracted fashion designer, writer and lecturer Tony Bennett to the festival. Bennett has worked as a fashion consultant, and wanted to raise knitwear from its “country cousin” reputation. He has lectured at the Central Institute of Technology in the fashion and textile department, and incorporated knit into costume design for theatre and stage. He boasts more than 300 awards in fashion design and wearable art. At the festival, Bennett will be presenting an evening of fashion on parade featuring a range of his own and other designs. He will also be leading workshops. One is “Picture Perfect”, encouraging knitters to take inspiration from everyday images and translate them into knit. Bennett also presents “Dare to Design”, a way to stretch machine knitting techniques to create up-to-date fashion garments. “There will always be a special place in my heart for that beautiful classic knit, but our machines allow us the potential to create so much,” he said. Other workshops will cover design, children’s wear, dyeing, felting, finishing, and making buttons. Festival participants will compete for a range of prizes, with this year’s Capital Shield theme, chosen by the Manawatu area, being “Birds of a Feather in Shades of Blue”. The exhibition is open to the public on Thursday, July 17, from noon until 5pm, from 10am to 5pm on Friday, and 10am until noon on Saturday.